People love to share their favorite things. They write gift guides. They sing songs about them. They form committees to publish lists. They will bore you endlessly at parties. However, most of that is just talk. To really know what someone’s favorite things are, they need to put their money where their mouth is: what things did they actually spend money on? Of course, the cost of things doesn’t necessarily correlate with liking something. Especially in the Bay Area, people are willing to pay a lot in rent for places that they will complain endlessly about. Some things are just expensive. However, I was inspired by my friend Tom to a similar but slightly different metric. Tom loves the video game Morrowind. By his own admission (which I have no reason to doubt), he literally spent an entire summer only playing the game and sleeping. He has likely spent thousands of hours in the game. That fact isn’t so shocking: people spend a lot of time on their hobbies. However, I was shocked when Tom mentioned that he had purchased Morrowind (at his own estimate) more than 5 times. For more or less the same game, he had bought physical boxes, several Steam bundles, and console versions of the game. That is a true measure of your favorite things: how many times you bought a product, especially for non-consumable, non-degradable products. We can divide up multiple purchases into 2 cases: more for yourself and more for others. The first case demonstrates true commitment to a product. Sometimes you just love something so much that you just want to give more money to whoever made it. It’s totally irrational because you don’t gain any additional benefit from it: it is basically a gift. The second case is also compelling. You enjoyed a product so much that you didn’t just make a Facebook post to tell others to buy it: you actually bought it for them. It was so impactful for you that your loved ones also needed it in their lives. With that in mind, I thought back upon my own life and what the things I had bought the most times. Here are a few that I have come up with. StarCraft: 4 times. By value, it is perhaps the least I have spent on repeated goods. I first played StarCraft by burning copies from friends. Later, I bought 3 secondhand copies of StarCraft from Half Price Books so that I could play online and could give copies to other friends to play online. We played a lot of Brood War in high school. In total, those 3 copies costed me less than $10, but since I was still on an allowance then, StarCraft might be the most expensive item as a percentage of my disposable income. More recently, I bought a copy of StarCraft: Remastered. I only really played it for one afternoon when I played some RPG UMS games, but it was worth it for the nostalgia. StarCraft 2: at least 4 times, maybe 9 if you count expansions. Similar story. I bought a copy for myself and bought several copies for others to play. It is normal to own 4 copies of a rare Magic card because you can have up to 4 copies of a card in one deck. More than 4 is somewhat odd. I ended up with 6 copies because I had 2 and then bought 4 online (since “single” cards are typically sold in sets of 4). Oddly, I had 1 English copy (from a regular pack), 1 Italian copy (from a cheap box I split with my friend), and 4 Japanese copies (because that was the lot online). I knew what the card did, so I didn’t need to be able to read it, so it was fun having it in multiple languages. However, I really did like this card a lot and didn’t mind the extra copies. 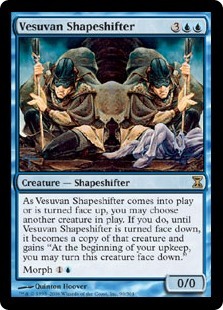 This card was printed right around the peak of my excitement about Magic: the Gathering, and it used the Morph mechanic. It was the cornerstone of the “Soggy Pickles” deck that I had built a similar version of. The Martian: 3 times. I really liked The Martian. It makes the reader feel good because it is so science-y while being funny and engaging at the same time. It also became a great movie for even more exposure. Ironically, I don’t actually own a copy right now because I gifted my copy to someone else and bought it for 2 other people. I think that this gift was even better from me because Andy Weir is a local author, so all of those copies were signed. Polyhedral Dice: 9 times? For Christmas this year, I bought dice for many of my regular D&D players. Although we play online where random number generators do all of the rolling, I think every D&D player should have their own set of dice: a d4, d6, d8, 2 d10s, d12, and d20. I will note that compared to other players, I don’t really love dice per se. At my local game store, many players have at least dozens and perhaps hundreds of dice, which they tote around in large bags. I don’t really appreciate the craftsmanship or appearance of nice dice, but I am an evangelist for the game. D&D 5th Edition Player’s Handbook: 3 times. And just to verify that, I did gift the core rulebook for D&D twice. I might end up buying another copy for myself if it falls apart too much. Regular readers should not be surprised by this list because I write about them all of the time. Although I like my blog to be insightful, it’s reassuring this sometimes, the results are unsurprising and that my life is what I thought it was.